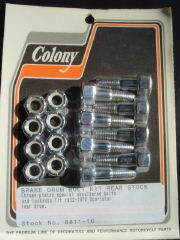 Special shouldered bolts and locknuts fit 1952-1978 XL rear drum. 5/16" X 24 thread pitch, Special Hex. Colony Stock # 8811-16 and 8812-16.